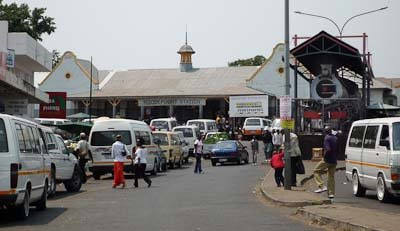 This photo shows a busy taxi rank at the Roodepoort station - the station building was built in 1911. To the right the plinthed class 10BR no. 750, built in 1910 by North British Locomotive Co as works no 18974, features under a roof. The Class 10BR wheel arrangement is 4-6-2, the cylinder bore x stroke is 20"x28" with 5'2" diameter driving wheels. The total length of the locomotive and tender is just under 64 feet. A further order for "Pacific's" (or locos with 4-6-2 wheel arrangement) to the design of G.G. Elliot placed by the CSAR with North British Locomotive in 1910, was spilt between 5 that used saturated steam and 5 that were superheated. 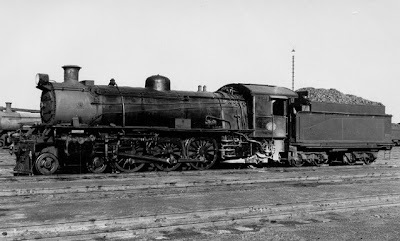 The saturated engines (no.s 747-751) became Class 10A. During the 1930's, when many of these engines required new boilers, A.G.Watson rebuilt them with a standard No 1 boiler and they then became Class 10BR. 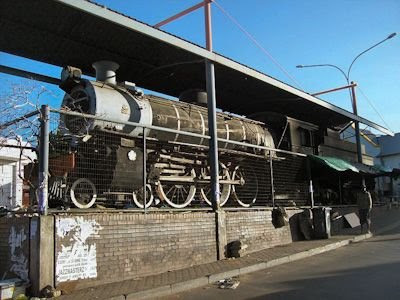 After beginning work on the passenger trains out of Johannesburg, they were ultimately used to good effect on the Reef suburban routes, while a few were also used around Cape Town. Most of their working lives, however, were spent on the Cape Midlands where they were used initially on the main line out of Port Elizabeth. 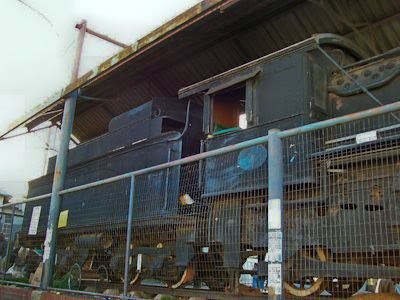 Two engines of this class worked as station pilots at Kimberley until 1960 when they joined the rest of the class then working the Uitenhage suburban. As train loads increased, they were put on the shunt until scrapped in 1974. 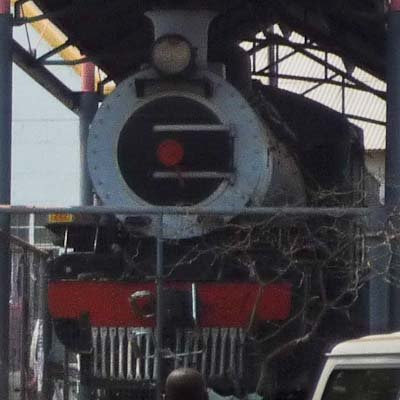 This locomotive has a Class sister No 756 plinthed at Kroonstad station. 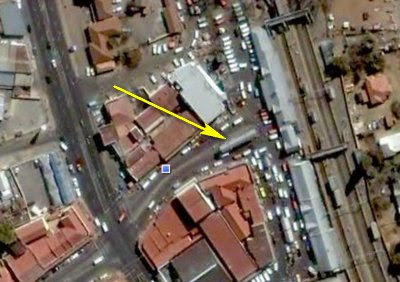 The arrow shows the location of the roofed shelter of the locomotive in front of the Roodepoort station building. The following pictures were taken by Derek Walker. Derek's comments are also also given. Loco 750, class 10BR, Built 1910, entered service 1910, withdrawn 1972, built by North British Loco Co Ltd.
She is in surprisingly good condition, if somewhat festooned by the usual hawker detritus and rubbish. I couldn't get into the cab because it was currently "occupied". 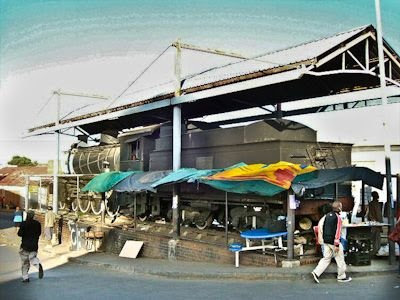 You may see more of Derek Walker's photos taken at the Roodepoort station, by following this link.